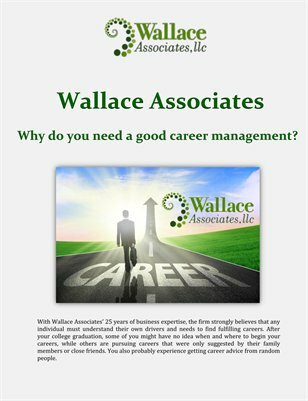 Wallace Associates: Why do you need a good career management? With Wallace Associates' 25 years of business expertise, the firm strongly believes that any individual must understand their own drivers and needs to find fulfilling careers. After your college graduation, some of you might have no idea when and where to begin your careers, while others are pursuing careers that were only suggested by their family members or close friends. You also probably experience getting career advice from random people.